After demonstrating their passion on the pitch, 30 Bolivian girls stood out among hundreds of women to be part of the professional team of a top club, the Tigre de La Paz. The South American Football Confederation (CONMEBOL) requires that all teams have a female squad so that clubs can attend the regional cups in 2019. “I see on the pitch a great development of the women, I see a lot of passion when they go to the stadium, the La Paz woman have a lot of character, they are entrepreneurial and that can be transferred to this sport”, the coach of the women’s team, Daniel Rosales said. The Venezuelan coach said that more than 100 women showed up for the trials and a month ago the professional team began training with girls from 16 to 27 years old, and they also chose 16 players for the youth category. “We want to change the way we see this sport in female discipline, so it’s not seen as a masculine sport,” Rosales emphasized. 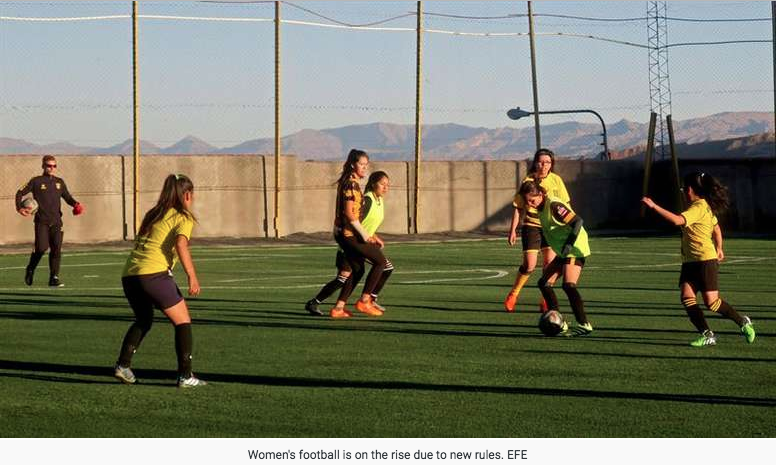 The coach added that they are “pioneers” in women’s soccer training and that they are among the first Bolivian teams that are complying with CONMEBOL standards. The license regulation for clubs approved in 2016 by CONMEBOL establishes a series of requirements for the operation of the South American professional teams, among which are a first women’s team and another youth team. The strongest team qualifies for the Copa Libertadores next year. This demand for many women has meant an opportunity to demonstrate their ability on the pitch, their passion for football and dream of a professional career. This is the case of Camila Vargas, 16 , who is among the 30 selected and wants to start a career in football and show her family that women can also succeed in this sport. “I did not have the support of my whole family, my grandfather enrolled me in football schools, my parents did not want to because there are not many women’s teams, but I have shown that I can,” Vargas told EFE. The footballer added that during a year she trained with men, but a month ago she found girls who share her same passion. Brianna Figueredo , also 16 years old and trained since her eight, said that it is necessary that in all sports there is a gender equality and at the same time provide spaces to improve their performance. “It seems very good that we start to form groups like this and show that we can and do not fall behind,” he told EFE. Forward Jhoseline Quispe , meanwhile, recalled that despite having faced some comments for playing soccer, dreams of reaching out to represent Bolivia . “This is the time to make an effort, to learn more than I already know, to go ahead and to go very far,” Quispe mentioned to ‘EFE’. All are focused on demonstrating their dexterity and performance on the court to become a benchmark among the players. Quispe said he admires Alejandro Chumacero, the emblematic stronguista canterano [from the quarry] who plays in Puebla, and said he dreams of being a benchmark in the women’s bank as he is in the country. The 30 girls must combine their studies and jobs with their workouts , which are four times a week, to improve their technique and agility on the court. The coach said that although there is currently no Women’s Soccer League in Bolivia, the club wants to be ready and have the best players to offer a level football. In Bolivia, the Wilstermann of Cochabamba qualified for the Copa Libertadores next year, while San Jose de Oruro and Guabira de Montero made it to the Copa Sudamericana, which according to the regulations must also conform their women’s teams.